Maggie (Floriana Lima) is in charge of a hostage situation. She is trying to talk the criminals into releasing their hostages. Suddenly Supergirl (Melissa Benoist) flies through the roof and brings out the criminals. Hostage situation solved. Maggie is upset at Kara’s interference; she had been working on this for seventeen hours. Kara doesn’t notice that Maggie is upset; she can’t wait to see her at dinner. 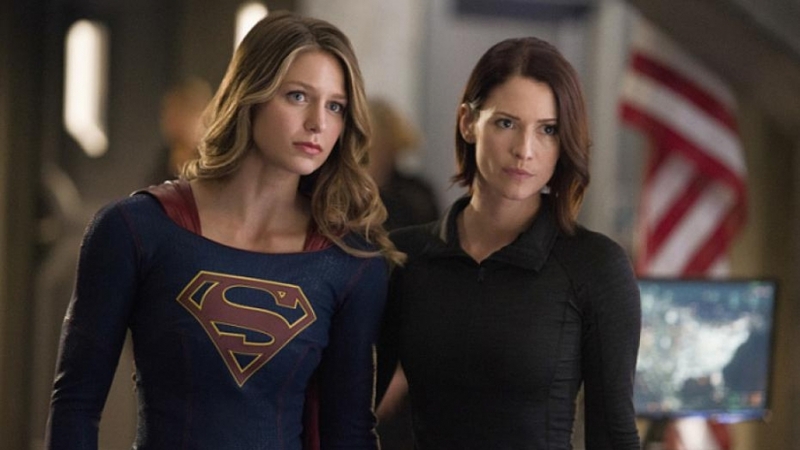 At dinner, Maggie and Kara quarrel over Supergirl interfering in police matters concerning humans. Defense attorneys are even using a ‘Supergirl’ defense for their clients. Mon-El (Chis Wood) tries to smooth over the situation by saying punching is sometimes better than talking. With superheroes like Kara and him, what do the police actually do? This isn’t helping the situation. Kara snidely apologizes for making Maggie upset and leaves. Mon-El follows her. Alex (Chyler Leigh) plays the peacemaker. She wants her girlfriend and sister to get along. Maggie doesn’t have a problem with Kara, but sometimes Supergirl annoys her. Maggie promises to try to get along. Alex is leaving to talk to Kara so she’ll try to. Both women can be stubborn. Alex gets on the elevator with a strange man already in it. A frantic Maggie stops at CatCo to see Kara. She hasn’t seen or heard from Alex since she left to talk to Kara last night. Kara hasn’t either. Alex hasn’t reported in at the DEO and they can’t get a signal from her tracker. Just then, Kara receives a call from Alex’s phone, but it isn’t Alex; it is the voice of a man telling them he has kidnapped her. He shows a picture of a knocked out Alex. He demands Kara break a prisoner named Peter Thompson (Gregg Henry) out of prison in 36 hours. The caller knows Kara can do this because she is Supergirl. Alex wakes up in a glass cell. There is a camera watching her. She screams at the camera that she knows who kidnapped her. She tells him to let her out or he will be in a world of trouble. Back at the DEO, Maggie, Kara, Mon-El, Hank (David Harewood), and Winn (Jeremy Jordan) discuss the situation. Mon-El wonders aloud why they can’t just release Peter Thompson. Hank answers that they don’t negotiate with terrorists and Maggie adds that there is no guarantee the kidnapper will let Alex go. There aren’t any clues to who the kidnapper is; he is a ghost. Maggie using her police experience states that since they don’t know who did this, they have to ask themselves, what the connection between Peter Thompson and their ghost is. Hank, Maggie, and Kara go to the prison to talk to Peter Thompson. After Hank introduces everyone to him, he says, “The Fed, a pig, and a jurno. To what do I owe this pleasant confusion?” Thompson denies knowing anything. Hank reads his mind and can confirm that. Back at the DEO, Winn uses facial recognition from Thompson’s lone visitor to determine it is his son Rick Malverne (David Hoflin) from Midvale. Kara realizes she knows Rick; he went to school with Alex and her. She immediately flies over to his place and demands he tell her where Alex is. He isn’t scared of Supergirl, even when her eyes become fiery. He demands they free his dad. Kara brings him to the DEO. For some reason, Hank can’t read his mind. Kara is confused, back in school he was a nice guy, he even carried Alex’s books. Maggie and Kara go into the interrogation room to speak to him. In a flashback, he relates how he figured out that Kara is Supergirl. One day young Alex (Jordan Mazarati) and he (Zayne Emory) were at the beach with other classmates. There was an accident and young Kara (Malina Weissman) saved a baby from a burning car. Everyone attributed Kara’s burst of strength to adrenalin, but he thought it was suspicious. He knew that Kara had moved to National City. A few years later Supergirl popped up. He has seen Kara without glasses, so he figured out Kara was Supergirl. He tells Maggie he didn’t know that Alex played for the other team. Kara wants to know why he is doing this. His mother used to beat him. She kept the identity of his father from him. One day his dad appeared and took him away from his mother. He took care of him and even sent him to college. A few years ago, the police arrested Thompson for two murders. Malverne thinks they had it coming. Kara loses her patience with this jerk and tosses him around. Maggie has to stop her. He wonders who loves Alex more between Kara and Maggie. They leave the interrogation room, Kara is still angry but Maggie believes she knows how to get to Rick, through his father. Supergirl arrives at the location from where they are getting Alex’s signal. We get a shot of Alex in her cell waiting for rescue. There is a lead cover blocking where Supergirl thinks Alex’s cell is located. She tears the lead cover up, but it activates a clock. The clock runs down from the 20 hours they had to find Alex to four hours. Alex’s cells starts filling up with water. Maggie: “And you think that trumps me? That you know what’s right for her? I got her to be herself, Kara. I have just as much to lose as you do. You should have listened to me.” For the first time it appears that Kara is listening. Lena calls Kara but she can’t talk. Hank walks outside the balcony and Kara tells him she is listening for Alex. She can do all these super things, but none of it can help her save Alex. Kara admits she should have listened to Maggie. Hank assures her that no one blames her. Alex is the most important person to her, him also. They hug. Maggie goes into Malverne’s cell. He tries to convince Maggie to break his father out of prison. Malverne watched them and he knows how much Alex and Maggie love each other. Maggie looks unsure of what she should do next. While this is going on at the DEO, Alex is trying to turn the water off and break the glass. She takes off her pants and fills it with water to use as a floatation device. Still looking for clues to Alex’s location, Winn notices that Maggie is missing. She is at the prison using DEO tech to break out Thompson. 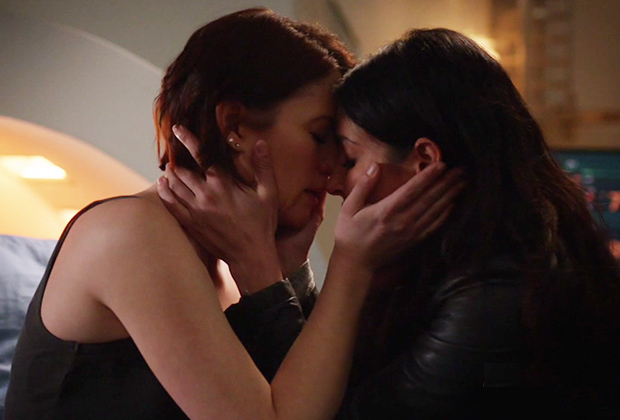 When they are about to leave, Supergirl shows up to convince Maggie not to do this. She then turns her attention to Thompson and appeals to him being a good father and not letting his son commit a murder. Alex’s time is up but Thompson thinks of a place Alex might be. Alex draws her last breath when Supergirl arrives and frees her. Maggie is by Alex’s side in sickbay. Alex awakens and tells Maggie she knew she was coming. Alex: “I love you Maggie Sawyer.” Maggie: “I love you Alex Danvers.” They want to have all those firsts together. Alex and Maggie walk out of sickbay, they are escorting Rick Malverne to prison. Not before Hank wipes his mind. Malverne is a little snot towards her so Alex decks him. She asks Hank not to wipe his memory of that punch. Off to the side, Maggie thanks Kara for not letting her make such a big mistake. Kara reminds her she was just following what Maggie said. She tells her they make a great team and they hug. Lena: “More like apocalyptic, but you know…” Rhea describes her personal life but changes some of the facts. She had a close relationship with her son, but he met a horrible woman who made him abandon his family. On top of that her husband recently died. (Thanks to his wife’s knife.) They bond over their messed up family lives. Lena is not dumb. Using the device she invented to detect aliens, she confirms that Rhea is an alien. She throws her out of her office for her deception. Later Rhea appears outside Lena’s office window to apologize for lying. She tells her she thought Lena shared Lillian’s hatred of aliens. She apologizes for misreading her. Rhea thinks they can do great things together. She proposes they build a portal that can help Earth and get her back home. Lena will think about it. She tried to call Kara but Kara can’t talk. After rescuing Alex, Kara calls Lena back. Lena asks if she is all right, and Kara assures her, she is now. Lena tells Kara she called her for some advice, but she has it figured out. Rhea is in her office. She tells Rhea “let’s change the world” and Rhea agrees with a wicked smile. Kara Danvers is a mild mannered reporter. Her alter ego Supergirl is far from it. She is a very confident superhero. Sometimes her confidence edges into arrogance. Who can blame her though, if you could fly, had super strength, and saved people all of the time, you’d have trouble listening to other people too. If that is the worst thing, someone could say about you, you’re doing something right. Kara is having a hard time listening to Maggie Sawyer. She likes Maggie, but she is just a detective. It’s not as if she is Hank, Barry Allen, Mon-El, or even Rhea; she is just a regular person. When Alex is in danger, Kara isn’t listening to anyone, definitely not a regular person like Maggie. Kara is also a little possessive of Alex, so girlfriend doesn’t quite rank as high as sister. Except Maggie is more than just a girlfriend, she and Alex are partners and their relationship should be respected as much as Kara and Alex’s relationship. It takes a while for Kara to believe it. Kara is going off half-cocked, making things worst. It is only after she really listens to Maggie and applies the less brawny approach that they are able to save Alex. It was nice seeing them paired off together. Usually when they share a scene, Alex is there, so it was nice seeing them trying to deal with each other without that buffer. While Kara and Maggie were bumping heads, Alex was on her own. Instead of being the damsel in distress, waiting for Supergirl to rescue her, Alex was a complete badass on her own. She dismantled a camera to activate a tracker she cut out of her arm. She made her pants into a floatation device, and she decked that creep Rick Malverne. She might not be a superhero, but she is a hero in her own right. The Rhea and Lena scenes were great. Teri Hatcher is bringing so much to this role. You can see why this woman can sweep up Lena, probably against her better judgement. With Lillian being the worst mom ever, you can see why she would gravitate to Rhea. Even though Rhea is using Lena, I think she might actually like her. She has more on the ball than her wayward son. She’d probably like to fix him up with a nice girl like Lena. The only problem I had with this episode was the villain, Rick Malverne. For such a regular guy from Midvale, he is one of the greatest evil geniuses of the world. Figures out who Supergirl is, even though that shouldn’t be hard. Why more people don’t figure it out immediately is a mystery. He follows all these people around for a year and no one detects him. He seems to know everything about the DEO, even that Hank is a shapeshifter. Isn’t the DEO a secret government agency? Wouldn’t they know some strange man watching their organization and following their agent? They must have received their training from the same people who trained the Star City Police Department. The dude can even prevent Hank from reading his mind. An alien who had psychic powers couldn’t stop Hank from reading his mind. Malverne is also some kind of engineering expert, switching the IP address. How did he even know Alex was going to be able to send out a signal? The writers made him unbelievably formidable. Aside from him, I really loved the episode. There wasn’t as much action as other episodes have had but the relationship drama between the five women in this episode was great.